These were the first words out of my mouth when I heard of a “specialty” hanger designed for sporting equipment. In a world where the most mundane utilities can be packaged to make them seem like essentials for living, skepticism can take root in the most positive of us. The only competition is made by xs SCUBA. The style varies little, but construction is dramatically different. But once you take a look at the Underwater Kinetics specialty hanger , you’ll join the ranks of skiers, divers, runners and surfers who wander the streets in a zombie-like state whispering “…must have hanger…must have hanger…”. The only question you’ll have is why there are so few manufacturers of such a handy, simple, inexpensive device. With the variety of uses available, one would assume the sporting goods manufacturers would be clamoring over themselves to have a piece of this market. For the novice, the idea is simple: a hanger on which you can stow your gloves, boots and hood which can then be hung up on a balcony railing, shower rail or side of the dive boat (while in transit, of course!) The only alternative, really, is to join the ranks of those vacationers who toss their equipment into the dive locker and hope the boots dry out enough to slip onto your feet the next day. Don’t be fooled – all three of these features are not only helpful, they are essential for ease of drying wet equipment as well as convenience of locating the pieces for use in hotel rooms, resort bathrooms or inside a wet-locker. Many of the dive shops in the tropics provide easy-to-dry racks for their guests – many of which are constructed of metal. When the rust begins, the flakes of rust can easily make their way into regulators, boots, gloves and zippers. By using the hanger, you can avoid not only rust flakes, but keep your gear separated from the other guests’ equipment. A wonderful side effect is the smell factor. No more smell of day-old salt water. Once these have been hung out overnight in the cool island breeze, you may just get a whiff of coconut. The device retails for $15.99 and is available in yellow (part #24011) or black (part #24013). 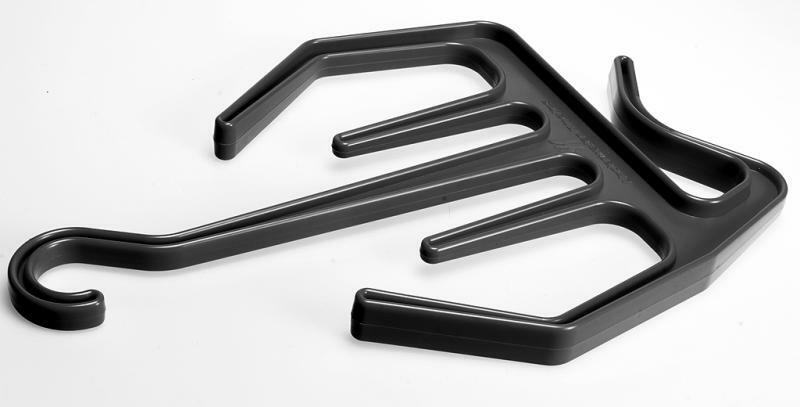 The specialty hanger is perfect for SCUBA gear, skiing accessories and a variety of water sports.